1. Preheat the oven to 190 C. Line 12 muffin cups with paper liners or spray the wells of the pan with non-stick cooking spray. 2. In a large bowl, whisk together flour, sugars, baking powder, and salt. Set aside. 3. In medium bowl, whisk together melted butter (make sure it's not hot or warm), eggs, milk, and vanilla, mixing until well combined. 4. Make a well in the center of the dry ingredients and pour the liquid ingredients into the well. Stir until ingredients are just combined - do not over mix the batter. Fold in the chocolate chips. 5. 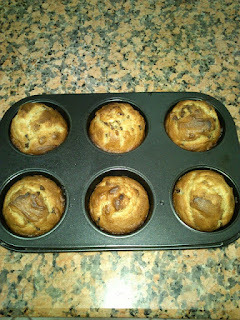 Evenly divide the batter into the prepared muffin pan wells (i use a round ladle or ice cream scooper). Bake for 17-20 minutes or until a toothpick inserted into the center of a muffin comes out clean.